I had a slow start to June and didn't get through as many books as I would have liked to. Here's what I did actually read this month. Hollow City by Ransom Riggs: This is the sequel to Miss Peregrine's Home for Peculiar Children. The series is a trilogy, and so far, I liked this book the best between it and the first book.There were less creepy pictures in this book, and I was super okay with that. If you read my review for book one here, I talk about how I'm not a fan of the photos and feel that they almost take away from the story. So, since book two has less of those pictures, I enjoyed this book better because of that. This story is also more action packed and moves a little quicker. At this point, you know most of the characters, but there are still new characters and new developments taking place. Smashed by Koren Zailckas: I'm a fan of memoirs, especially about struggles with a substance. I don't know why, but I do really enjoy reading them; they're intriguing to me. (see A Million Little Pieces and My Friend Leonard by James Frey.) This book though? I didn't enjoy. I didn't hate the book, but I wouldn't recommend it. I may it all the way through the story, but I struggled with it. Maybe I just couldn't connect with the author. I also have the "sequel" memoir Fury and the novel Mother, Mother by the same author on my bookshelves to read, and I probably will read them. I just wasn't a big fan here. 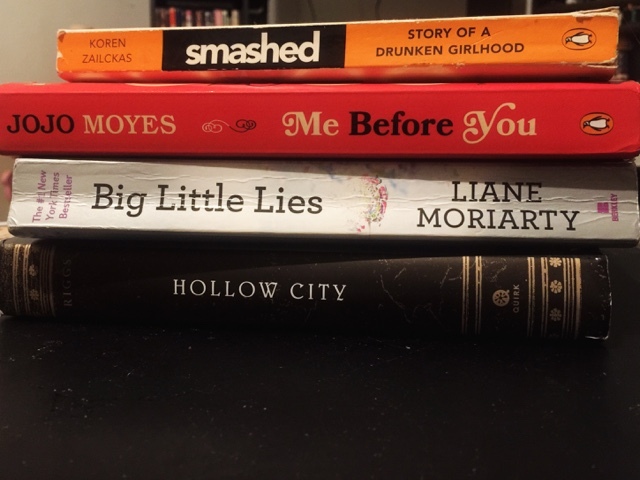 Big Little Lies by Liane Moriarty: See review here. Me Before You by Jojo Moyes: I enjoyed this book. I was able to get through it pretty quickly, because it was such an interesting and well-written read. It definitely was a tear-jerker, and I stayed pretty hopeful throughout the entire book. I'm definitely interested in reading more from Moyes. I haven't heard of a few of these, I'll have to check them out. I just finished You over the weekend, it was really good! Big Little Lies was my favorite out of all of them, so if you only read one, read it!